<!-Otto Henry Bacher. 1956-1909--> Otto Henry Bacher. Laguna Veneta. Laguna Veneta. 1880. Etching. 5 x 7 1/4 (sheet 8 3/4 x 11 1/4). Venetian series, #22. A rich impression printed on chine collé mounted on white wove paper. Signed 'Otto' and dated 'August 23 80' in the plate; in pencil. $1,750. Otto Henry Bacher was a book illustrator and etcher. He joined a colony of American painters established by Frank Duveneck in Polling, Bavaria. In 1880 the 'Duveneck boys', a group that also included John White Alexander, Robert Frederick Blum, Charles Abel Corwin, George Edward Hopkins, Harper Pennington, Julius Rolshoven and Theodore M. Wendel, travelled to Venice where they formed friendships with James Abbott McNeill Whistler and Henry James. The young painters were in awe of Whistler's experience and reputation. JW, who enjoyed their admiration, happily discussed his work and gave advice to the students. He used to come and sketch from the windows of the Casa Jankowitz on the Riva San Biagio in Castello where the group were staying. Bacher, who collected Rembrandt etchings, was himself a proficient etcher. He became an apprentice and collaborator with Whistler, who described him as 'one of his favourite pupils'. JW, who was having difficulties with equipment in Venice, made use of Bacher's printer's ink and printing press from June to August 1880. 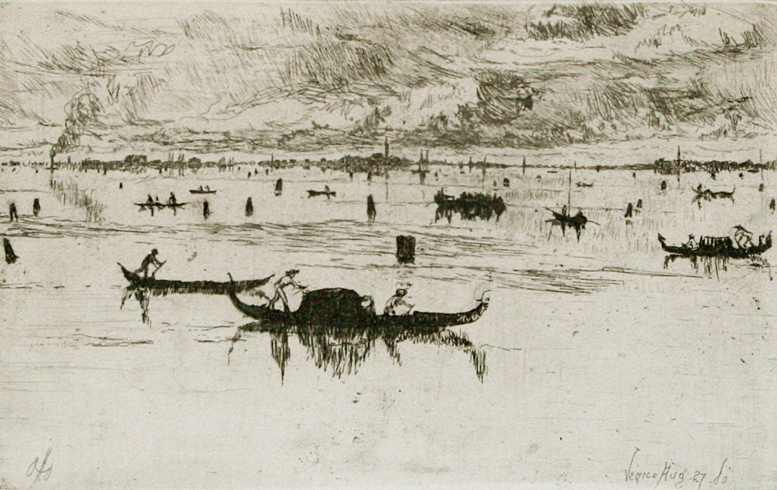 Bacher began to collect Whistler's Venice etchings. Bacher's etchings show the influence of both Whistler and Duveneck, the former in the small format and Duveneck in the strength of line and complexity. Bacher in turn felt Whistler to be influenced by his method of tonal printing, his 'Bachertypes'. To order, to request more information or to be placed on the email list, please contact Jane Allinson (jane@allinsongallery.com).